These coffee cup desk organizers have got to me one of my favorite projects yet. First let me start by confessing my Starbucks addiction. I love iced green tea lattes – so much that I finally broke down and ordered the ingredients from Starbucks.com so I don’t have to keep driving to the store (always forgetting to take my reusable cold cup) every morning. Not only am I about to save a ton of money but I’m going to keep a lot of plastic cups out of the trash. 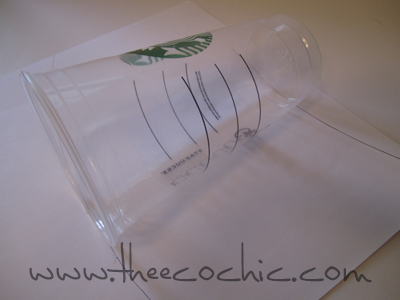 Begin with a clean plastic cup and trace the size of the cup onto the back of your decorative paper. 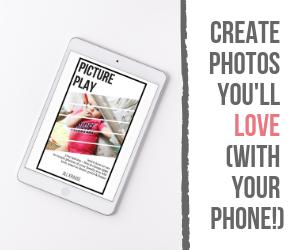 I used scrapbook paper that I have in my art closet but you could also use magazine pages, newspaper, or phone book pages. Cut along the inside of your lines following the curve of the cup. 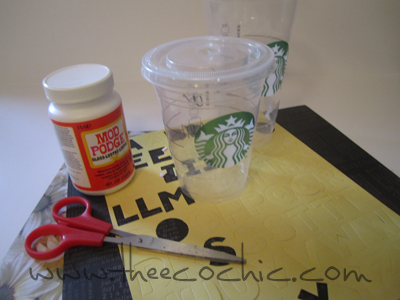 Apply Mod Podge to the back of the paper (or directly on the cup) to adhere the paper to the cup. For an extra special effect I added an accent paper around the middle of the cup along with some die cut letters spelling out “Pens” and “Stuff.” I also applied a layer of Mod Podge over the top of the entire cup to seal the paper. Allow your cups to dry and then fill them up with your desk accessories. 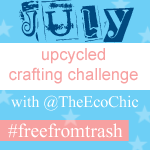 Super simple craft project and it only took about 20 minutes from start to finish. Eco-Notes: If you have a Starbucks addiction like me do you remember your reusable cup or do you end up with trash that needs to be recycled? My next project should be a sign that hangs by the door telling me to grab my cup!